Yearning to escape the shackles of monotony? Then you’ve clicked on the right link. 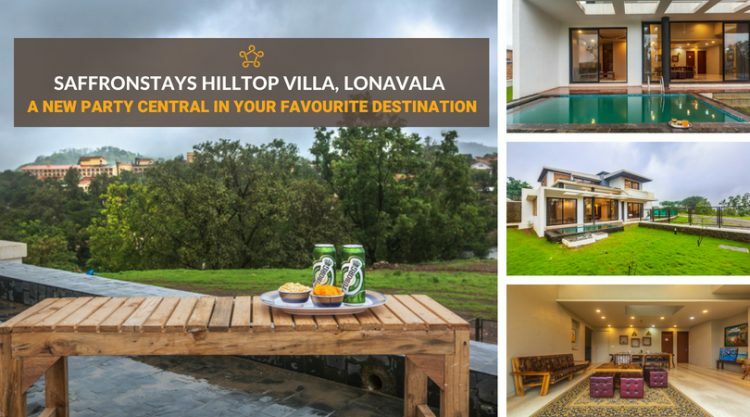 Presenting to you – SaffronStays Hilltop Villa – a new villa in Lonavala, added to our catalogue. The home has been specially designed to soothe your soul and rejuvenate your spirits amidst a charming setting. Lonavala, a popular spot for a quick getaway, is ideal for one and all, age no bar. And that is exactly where, SaffronStays Hilltop Villa is located. No matter how many times we’ve visited Lonavala, we always go back as it welcomes us with a pleasant weather. A 3-bedroom villa with wide – open spaces, minimal decor and comfy interiors, it is the perfect place to have fun. The floor-to-ceiling windows will make you feel like living alfresco. Peppered with bright, colourful paintings, the vibrancy enlivens the home. One of the three bedrooms is located on the ground floor while the other two are on the upper floor. Each of them are decked up in soothing tones, giving it an air of calmness and allowing the guests to fall into a serene sleep. Bid adieu to to your worries as you lounge in the plunge pool or sit out in the balcony with a cup of hot coffee overlooking the lush greenery or just stretch out on the green grass as a nice little breeze kicks up in the evening. Relive your precious childhood memories as the home has been stocked with several board games like Monopoly, Pictureka, Uno, etc. Enjoy the cool and the quiet, as you make a break from the city to SaffronStays Hilltop Villa for a splendid time! P.S – If you are travelling with a larger group, we have a 3-bedroom twin villa in the same complex – SaffronStays Tranquil Villa. To get more details for this pool villa in Lonavala, click here.